If you are hoping to buy the best wireless meat thermometer currently available, you have come to the right place! From now on your meat will always be perfectly cooked: Jack's Guide for Meat Lovers! You have probably already noticed that I am a meat kind of guy. From BBQ to roasts of all sort - you name it; I love it all! Preparing meat might seem quite simple, but if you want to cook it perfectly and have your meat as tender and delicious as it can be you have to invest some time in learning how to do it the right way. One of the most important things to master is achieving the right cooking temperature. It will not only make an enormous difference in how the meat will turn out in terms of taste and texture but also how safe it is to consume. A wireless meat thermometer can help you greatly! If you buy a wireless meat thermometer, you will be much more relaxed next time you decide to cook for your friends. Instead of sweating over the grill constantly checking if your burgers are done you will be able to spend time with your guests. 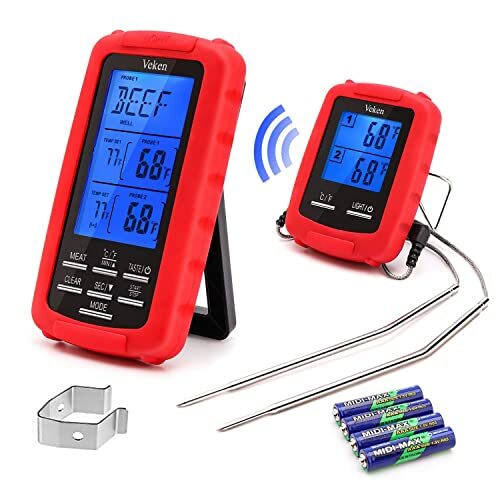 The best wireless meat thermometers will allow you to monitor the process and keep track of all you need to while doing something entirely else, so make sure you read this text to the end and find the best one for your personal needs! If you are wondering weather barbacue is healthy or not, read this informative article from the BBC Science Focus, or find some advice how to find BBQ food that is good for you in the Reader’s Digest. What Should the Best Wireless Meat Thermometer Be Like? Well, first of all, you want to be ready for grilling season! You can probably manage cooking indoors with an instant-read thermometer but once you get outside you will encounter some additional issues (such as fluctuant temperatures, wind, rain, heat, and smoke) that can make reading temperatures quite tricky. Besides being able to do whatever needs to be done (or just enjoy your free time), wireless meat thermometer allows you to leave your food be. How so? There will be no need to continually check on your meat and thus release the heat and smoke causing the loss of flavor and slowing down the cooking process. It is a rather simple device that consists of a transmitter, at least one pair of probes, and most of the times, a wireless receiver as well. If you do not get the receiver, do not panic, as some models pair with mobile devices for that purpose. As I have already mentioned, wireless meat thermometers enable you to check on how your meat is doing from anywhere in its range. Most models have an option of alerting you when the desired temperature is reached or the time you have set has elapsed so that you can hop by and remove the perfectly cooked meat from heat and serve it. Sounds great, doesn’t it? Further Reading: Check out our guides and find the Best 2-Burner Gas Grill, Best Smoker Grill Combo, Best Offset Smoker, Best Tailgate Grill, or the Best Grill Pan! It goes without saying (but I’ll say it anyway) that accurate readings are a must. Accuracy makes your wireless meat thermometer worth buying. If readings are inaccurate, you will end up with undercooked or overcooked meat, or even a foodborne illness. In short, you would have wasted your money! Therefore, it is best to make sure that the thermometer you choose is highly rated by the previous customers, and maybe even pay more than you have planned to secure accurate readings and be sure that the food you eat and serve is 100% safe. The wide range might not be necessary if you are a fan of tiny living, but if your house is on the large side, you might want to get a wireless meat thermometer with a greater reach. The manufacturer usually lists the maximum range but mind that it can be affected by physical interference (i.e., walls in your house). Wireless meat thermometers do not necessarily have to serve only for checking if your meat is cooked through - you can also use them to check the temperature inside your oven, grill or cooler but that might require a wider temperature range as well. The probes are the most important part of the thermometer, and therefore they have to be able to withstand extremely high temperatures and be durable. The cables need to be as tough as the probes, or otherwise, they might melt when exposed to the heat and make the thermometer useless. There are two types of wireless thermometer: dedicated remote and the app ones. If you opt for the dedicated remote, you will have all you need right out of the box. Otherwise, you will have to install an application onto your phone (Make sure your phone is compatible with the required app BEFORE you buy the wireless thermometer!). You can choose whatever option you prefer! The most basic models will alarm you when the food is cooked through, and the desired temperature is reached. However, more advanced ones will allow you to monitor a falling temperature as well or simply set the time after which the alarm will sound off and draw your attention. 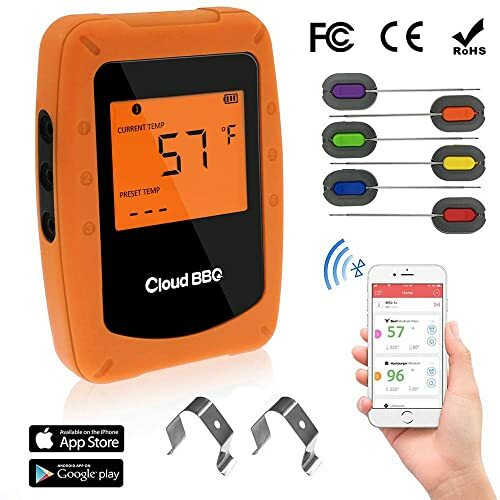 The ThermoOne Wireless Bluetooth Meat Thermometer comes with six color-coded probes that allow you to monitor different meats’ temperatures at the same time. Both probes and cables are made from high-temperature resistant material and seem quite durable. Color coding also makes the process easy to keep track of in the app. It operates on two AAA batteries. The app needed to operate the unit is easy to install and use. The outside wireless range of 196 feet and the indoor range of 100 feet (partition wall) are more than ample enough and allow you to have control and get accurate temperature readings all around your house no matter how big it is, unless you are royalty of course. You can rely on eleven preset temperatures for hamburgers, beef, chicken, veal, pork, fish, etc. or customize the temperature as you like. Once the meat is done, you will be alerted on the mobile advice of your choice with a beep and a flashing backlight. For your convenience, there are two magnets used on the back to mount the unit on any metal surface (non heated of course) and keep it safe once you are done. The Veken EN-2050 wireless digital meat thermometer is reasonably priced dedicated remote type unit that comes equipped with two food-grade stainless steel probes. Probes and probe wires can withstand the heat of up to 716°F and meet IPX7 waterproof standard too. It is highly accurate (1. 8°F/1°C) and can provide you with all the needed cooking info even when you are as far as 230 feet away. There are eight preset temperatures for eight types of meat most of us tend to prepare, such as beef, pork, chicken, and turkey but you can also customize the temperature and timer and prepare the meat as you like it. As we are already discussing personal tastes it is good to know that you can also choose to cook your steak rare, med rare, medium, med well, or well with a click of a button as well. The good thing about this unit is that it does not require any complicated setup as both the transmitter and the receiver are pre-synchronized by the manufacturer. The temperature range is huge from huge -4℉ to 572℉ or -20℃ to 300℃ and that makes the unit versatile too.The free lifetime return & refund services for all the customers cannot but make you feel secure. 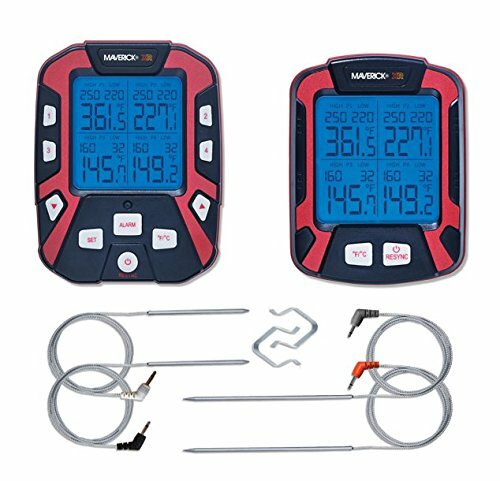 Maverick XR-50 Digital Remote Wireless Meat Thermometer comes with four color-coded probes that can measure temperatures between 14 and 574 ℉ (10-300 ℃). Both ℉/℃ options can be displayed alternatively with a click of a single button. The probes are both water and heat resistant and seem to be well made and durable. You can set High and Low alarms which is very handy. The best thing about this unit is the enormous wireless range of whopping 500 feet as well as the ability to send the signal through multiple walls. Large and easy to read display is easy to read in direct sunlight, and, thanks to the back-lit display, in the dark as well. Both remote and base unit come with a hook, magnet and a kickstand making them easy to carry around or store. If you are not satisfied for whatever reason, there is a one year warranty. I have noticed that sometimes the readings were a bit off (5-6° +/-) which might be a problem if you require high precision. A single button push instantly switches between Fahrenheit and Celsius display. 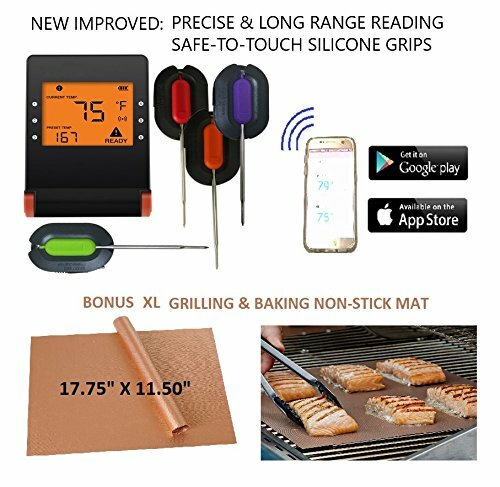 Nobilis Pro Wireless meat thermometer is ideal for all kinds of BBQ and grilling adventures as well as for smoking or roasting as it is easily controlled via EasyBBQ application on your smartphone or Ipad. It comes with four color-coded silicone probes (FDA approved) that are safe to touch, unlike the steel probes most other models have. The wires are made with the stainless steel mesh and Teflon cable and can withstand temperatures as high as 716°F. You can monitor the cooking temperature from about 160 feet away when you are outdoor or up to 100 feet indoors. The temperature you can measure precisely ranges from 32°F to 572°F, and there are also 11 preset temperatures for food you are most likely to prepare most of the times. Once the temperature is right, this thermometer will audibly alert you with an alarm but also flash so that you can see that it is time to remove the meat from the heat source. The timer can be set independently as well. The accuracy level is quite high (+/-1%). ThermoPro TP20 Wireless Remote Digital Cooking Food Meat Thermometer is one of the most sought of model on my review list, and that is for a good reason - it is both reliable and accurate. This unit comes with two food-grade stainless steel probes with an individual receiver and wires that can withstand a temperature of up to 716°F (380 degrees Celsius). It can help you monitor your meat cooking process from up to 300 feet away. It is ready to use without any tedious installation or synchronization - right out of the box. The LCD display is large, well lit and easy to read. 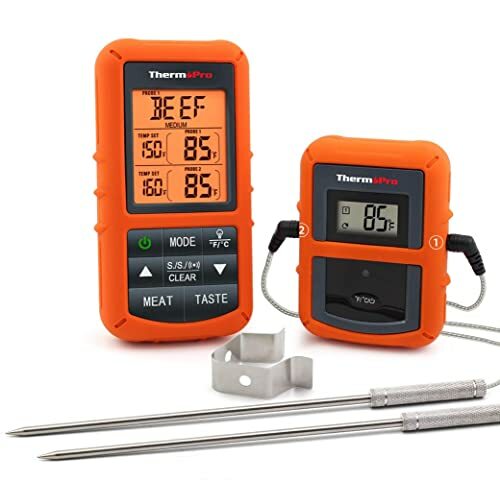 The ThermoPro TP20 can read temperatures from 32 to 572° F degrees, but you can also choose one of nine preset temps for various kinds of meat as well as choose the doneness level. The preset temps can be reset according to your preference as well. Besides an alarm, this unit also has a countdown / count-up timer. The timer can be set for two different functions (maximum 99 minutes, 59 seconds or maximum 99 hours, 59 minutes). The manufacturer provides an extended three-year warranty on the sensor and vouches to replace a faulty sensor probe. No hassle. ...Veken EN-2050 Wireless Digital Meat Thermometer since I have had trouble finding any fault to it. It is a precise and reliable unit that can help you not only prepare any type of meat but also provide you with some extra time for yourself or your loved ones! Not bad for such a small gadget! The lifetime warranty is only icing on the cake, so feel free to buy Veken EN-2050 Wireless Digital Meat Thermometer risk-free! To tell you the truth, you should not regret buying any of the units reviewed here as they all have the sole purpose to make your life easier!